Rep. Ilhan Omar (D-Minn.) — elected during the November 2018 midterms — now has taken aim at the Department of Homeland Security. 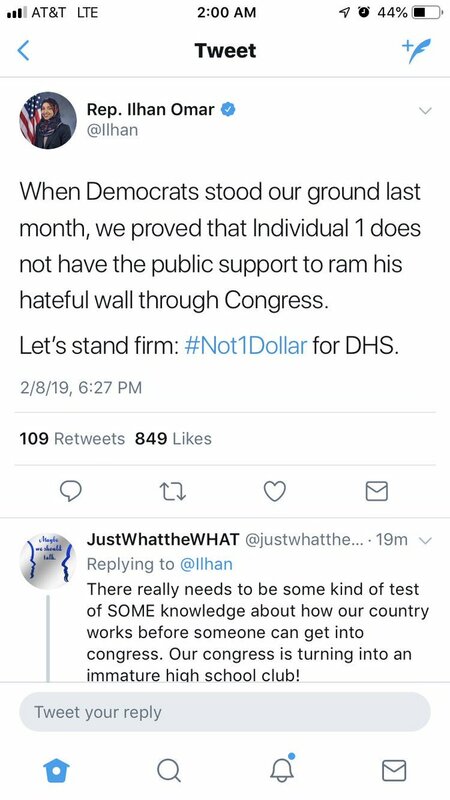 “Let’s stand firm: #Not1Dollar to DHS,” Omar urged her fellow Democrats in the tweet. “While there have been growing calls from Democrats to abolish ICE (Immigration and Customs Enforcement), there hasn’t been a strong demand to defund the entire Department of Homeland Security, which also includes the Transportation Safety Administration, Secret Service, Coast Guard and Federal Emergency Management Agency,” as Fox News noted in a piece about Omar’s comments. Never mind that President Trump’s approval rating jumped to 50 percent following his State of the Union speech this past Tuesday night. Omar has ignored that point completely. Here’s what’s also particularly interesting. 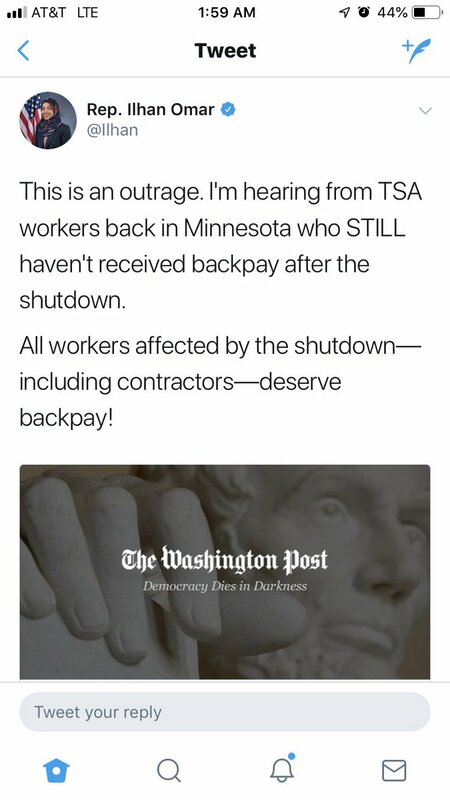 Shortly before calling for the defunding of Homeland Security, Omar “tweeted her outrage on behalf of TSA workers in Minnesota who haven’t received back pay due to the recent partial government shutdown,” as Fox News anchor Rob Schmitt pointed out in a tweet. Since her election in November, Omar — the first Somali-American elected to Congress and one of the first two Muslim women elected to Congress — has also accused President Trump of wanting a “coup” against Venezuela. During a recent interview on CNN’s “Newsroom,” anchors Poppy Harlow and Jim Sciutto cornered Omar about her unsubstantiated claims against Trump and Graham. Scary. Unbelievable she was elected. Legal and illegal immigration can help lead to poor representatives in Congress. Her ideas belong to some other country, not America. Creeping Sharia and socialism. Beezer and MW like this.